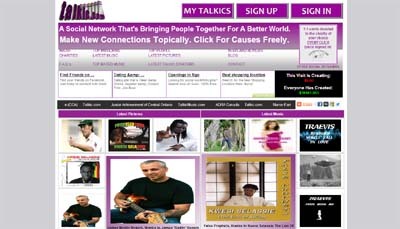 Talkic.com is a social network that’s on a mission to bring people together for a better world. In addition to being a means to make new connections and conversations across topics of interest, Talkic.com is also a free way to click for your choice of more than 20 charities from Canada, The US and UK. While users contribute their pictures, links, new music and comments across topics, Talkic.com donates 1.1 cents every click to the user’s chosen charity (~2/3rds of ad revenue). As part of Talkic, we also run TalkicMusic.com, a free new music marketing service that promotes new music and social good. All new music submissions get tweeted and posted to the other social networks as well. We’re bringing social good to the masses.